I'm using Gaussian to investigate a catalyst system. when treated with 2,4,6-triisopropylbenzenesulfonyl azide (N_3Trisyl). Running the reaction at 70 °C over 65 hours, an 84% yield was observed. There was no benzosultam yield when either of the other two analogues (R = neopentyl, NeoP, and R = trimethylsilyl, SiMe_3) were reacted with N_3Trisyl under the same conditions. I hypothesized that differences in activation energies for the C-N bond forming reaction were the root of the observed reactivity differences. I'm using the BP86 functional, with 6-31G(d,p) basis sets, GD3BJ dispersion corrections, and the CRENBL ECP applied to chromium. Benchmarking for thermodynamic properties was done against reaction enthalpies and activation energies from a set of 3 chromyl chloride hydrogen atom abstraction reactions done by James Mayer. A second set of coupled cluster calculated X-H and X-X bond dissociation enthalpies was also used. The BP86//6-31G(d,p) method with CRENBL ECP applied to chromium and GD3BJ dispersion correction gave mean absolute errors in the range of 4kJ/mol for Mayer's activation energy data, 14 kJ/mol for Mayer's reaction enthalpy data, and 10 kJ/mol for enthalpies in the coupled cluster set. 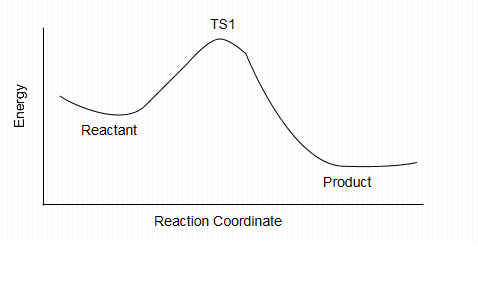 I used Gaussian to optimize structures of the transition states, reactants and products for each of the three analogues. From my results, I calculated activation energies for the C-N bond forming reaction for each analogue, as well as standard reaction enthalpies, entropies, and free energies. I calculated activation energies in the range of ~6-22 kJ/mol, with R = Ph being the lowest, as well as negative free energies of reaction, and favorable entropies and enthalpies of reaction for every analogue. These results suggested that some benzosultam should have been observed for the R = NeoP and SiMe_3 analogues. So now I'm stuck. The reaction should be spontaneous at every temperature, according to my calculations. But it isn't. Now I think I'm looking in the wrong place. Maybe I want to look for intermediates and a second transition state?
. 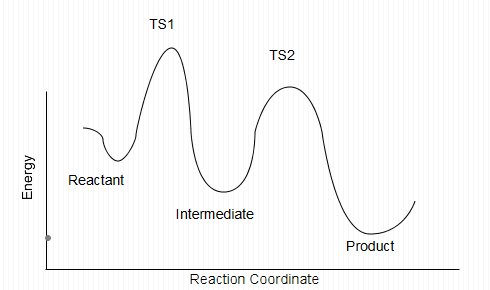 Meaning I could have calculated TS2 (in the second diagram) for each analogue, and ignored TS1, I'd have been looking at the wrong reaction step. There's also a possibility my method is inadequate. Or maybe I'm calculating energies using reactant and product structures which are at local, but not absolute, minima. Where do I go from here? What's the best use of my time? Is there a way to search the energy surface around the products and reactants to find lower energy conformers? Is there a way to search for intermediates and additional transition states? I feel a bit lost here. TL;DR: Thermodynamic properties that I have calculated for a catalytic bond forming reaction are not supported by experimental results. So, now I have the choice of revising my hypothesis and searching for another set of transition states and some intermediates, or searching the energy surface around my reactants and products for lower energy conformations. Do these choices sound reasonable given the data and evidence I've collected? Am I overlooking something? What to do? Browse other questions tagged inorganic-chemistry thermodynamics computational-chemistry transition-metals organometallic-compounds or ask your own question. How to calculate a reaction's DeltaH using a MM forcefield calculator software? What types of energies can be determined by molecular dynamics in gas phase or explicit solvents?